COLLEGE PARK, Md. – University of Maryland (UMD) researchers working with Bethesda-basedWeinberg Medical Physics LLC have developed a new technique to magnetically deliver drug-carrying particles to cancer tumors or other hard-to-reach targets deep in the body. The method has the potential to transform the way deep-tissue tumors and diseases are treated. UMD Professor Benjamin Shapiro,Fischell Department of Bioengineering (BioE), a part of UMD's Brain and Behavior Initiative and the Institute for Systems Research, and UMD alum Aleksandar Nacev (Aerospace B.S. ’09, BioE Ph.D. ’13) teamed up with Weinberg Medical Physics to exploit fast pulsed magnetic fields to focus nano-therapeutic magnetic particles to deep targets. Their advances in this area were recently published in the journal Nano Letters. For years, researchers have worked with magnetic nano-particles loaded with therapies – such as drugs or genes – to develop noninvasive techniques to direct therapies and diagnostics to targets in the body. Magnetic nanoparticle research garnered media attention in October, when Google X (Google’s innovation lab dedicated to furthering major technological advancements) announced its interest in the use of magnetic nano-particles for diagnostic applications. 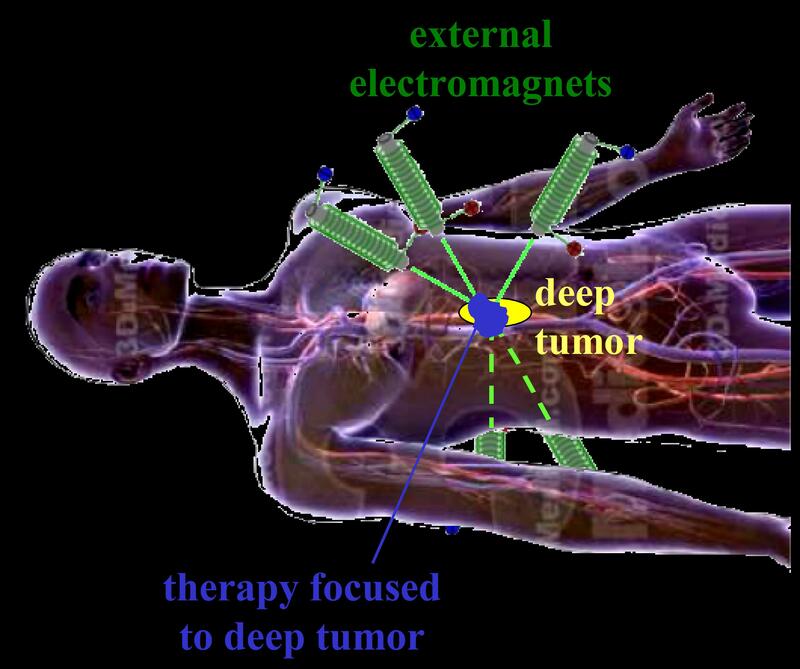 Instead of surgery or systemically administered treatments, such as chemotherapy, the use of magnetic particles as drug carriers could potentially allow clinicians to use external electromagnets to focus therapy to the precise locations of a disease within a patient. However, until now, particles could only be attracted to a magnet, and thus could not be concentrated to points away from the magnet face. As a result, in prior clinical trials magnets held outside the body had only been able to concentrate treatment to targets at or just below the skin surface. "What we have shown experimentally is that by exploiting the physics of nanorods we can use fast pulsed magnetic fields to focus the particles to a deep target between the magnets," Shapiro said. These pulsed magnetic fields allowed the team to reverse the usual behavior of magnetic nano-particles. Instead of a magnet attracting the particles, they showed that an initial magnetic pulse can orient the rod-shaped particles without pulling them, and then a subsequent pulse can push the particles before the particles can reorient. By repeating the pulses in sequence, the particles were focused to locations deep between the electromagnets. "The Holy Grail of magnetic drug targeting is the dream of using magnets outside the body to minimally-invasively direct drug therapy to anywhere inside the body, for example, to inoperable deep tumors or to sections of the brain that have been damaged by trauma, vascular or degenerative diseases,” said Dr. Irving Weinberg, a practicing physician and president of Weinberg Medical Physics. “We have shown that fast pulsing of external electromagnetic fields may be able to achieve this goal." Their study in Nano Letters, “Dynamic Inversion Enables External Magnets to Concentrate Ferromagnetic Rods to a Central Target,” shows that, with appropriate external magnetic pulses, ferromagnetic particles carrying drugs or molecules could be concentrated to arbitrary deep locations between magnets. Nacev, Weinberg, Shapiro and their fellow researchers are now working to demonstrate the therapeutic potential of this method in a project funded by the National Cancer Institute (NCI) Small Business Innovation Research program and featured at the NCI-sponsored Investor Conference in San Francisco. Additionally, the research team recently launched IronFocus Medical, Inc., a startup company established to commercialize their invention. A video showing the magnetic focusing can be seen at http://ter.ps/magnetic. "This technology could enable a new therapeutic modality that combines the spatial precision of traditional image-guided radiation with the biochemical specificity of molecular medicine," said Dr. John R. Adler, Vice President and Chief of New Clinical Applications for Varian Medical Systems. In addition to Nacev, Weinberg, and Shapiro, research team members and co-authors include: Pavel Y. Stepanov, Lamar Mair, Mario Urdaneta, and Mika Shimoji of Weinberg Medical Physics LLC; and Dr. Stanley Fricke of Children’s National Medical Center. Sam Kupfer, a summer student intern at Weinberg Medical Physics, built the electromagnetic apparatus used in the experiment. The fast magnetic fields were developed with funding from Small Business Innovation Research grants awarded by the National Cancer Institute, National Heart, Lung and Blood Institute, and the National Institute for Neurological Disorders and Stroke. Funding to develop the correct sequence of magnetic pulses was provided by the National Science Foundation.